Billy Nye and Mike Puzio demonstrate the special high-five they developed to honor NASA's OSIRIS-REx asteroid-sampling mission. CAPE CANAVERAL, Fla. — A few special guests showed up to see the launch of NASA's asteroid-sampling spacecraft yesterday (Sept. 8). Former TV "Science Guy" Bill Nye, who currently serves as CEO of The Planetary Society nonprofit organization, cheered on the OSIRIS-REx mission yesterday afternoon here at NASA's Kennedy Space Center (KSC), just hours before the probe's 7:05 p.m. EDT (2305 GMT) launch from nearby Cape Canaveral Air Force Station. 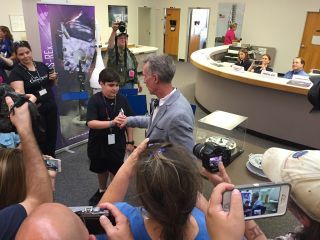 Puzio, who is now 12, joined Nye at KSC yesterday in the lead-up to the launch. "He's a rock star," Nye said of Puzio. "He won fair and square. We did not know that it was a kid. It's just, he had the best idea; he did the best research." Bennu was an ancient Egyptian god often depicted as a heron. Puzio has said he chose the name because of OSIRIS-REx's link to Egyptian mythology — Osiris was the ancient Egyptian god of the dead — and because the spacecraft design reminded him of a heron in flight. The "wings" are OSIRIS-REx's solar panels, and the "neck" is the probe's 11-foot-long (3.4 m) sampling arm. If all goes according to plan, OSIRIS-REx will arrive at Bennu in August 2018 and study the asteroid from orbit for two years. Then, in July 2020, the probe will grab at least 2 ounces (60 grams) of dirt and pebbles using a sampling "head" at the end of the robotic arm. OSIRIS-REx won't land on Bennu; rather, the sampling gear will give the space rock a 3-second "high five," mission officials have said. "We're really excited about this mission," Nye said. "This will advance our knowledge of the solar system's beginning." "If you want to answer, 'Where did you all come from, where did we all come from?' it's really important to get samples of the primordial solar system," Nye added. At KSC yesterday, Nye and Puzio showed off a high five they devised to celebrate OSIRIS-REx's launch and coming activities at Bennu. Nye touched his fist to Puzio's palm for about 3 seconds, and then the two slowly withdrew their hands. They took care not to "blow it up."